Entrance porch, with tumble dryer and plenty of space for boots and coats leading through to Sun lounge with sofa, two easy chairs and TV but why watch TV with such a magnificent view over fields to heather moor, forestry and mountains beyond. Washing machine in cupboard. Storage heater and electric heater. L-shaped living area with sofa, easy chair, upright chairs and dining table, open fire, TV and video. Kitchen area has electric cooker and extractor, fridge, freezer, microwave, kettle, toaster, sink/drainer as well as the usual cupboards and appliances. Storage heater and electric heater. Passageway leads past the front door to a small bathroom including washbasin, toilet, bath with curtained shower, heated towel rail and wall-mounted heater. 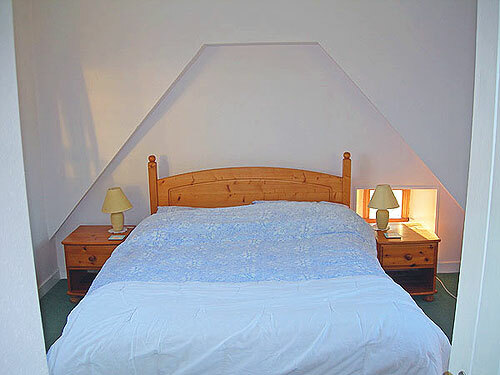 Downstairs twin bedroom with en suite toilet and washbasin, electric heater. The garden is mainly grass with a dry stonewall and plenty of space to sit outside in fine weather. Rotary dryer. 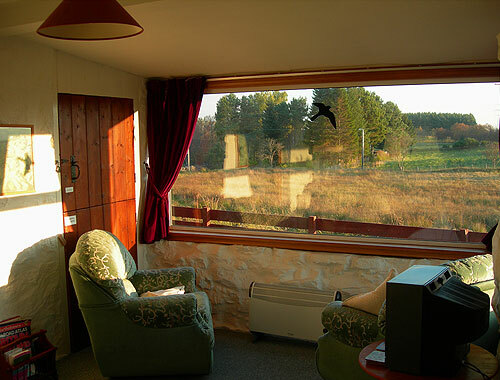 The cottage has mains water and mains electricity. There is septic tank drainage with a soak away. There is no gas or telephone.